Over 100 videos of new moves! Welcome to the second Aqua Magic Moves course! Aqua Magic Moves is designed to help instructors combine arm and leg patterns and make them into new exercises. They have the Magic to be executed in so many different ways that you will never run out of choreography ideas. There is theory included, cue recommendations, and other information you can use to execute the moves and understand the philosophy behind the system. You are provided with dozens of variations for three base moves: a Circle Ski 3, Corner Kick, and Rocking Mambo. This course is packed with videos to help you with pool and deck instruction, and to help you see and practice these innovative moves. You will never approach your aquatic exercise choreography the same! Understand how to safely and effectively alter intensity in the aquatic environment using the physical laws and properties of the water. Learn concepts to enhance movement and exercise performance in the aquatic environment. Review choreography styles to use with Aqua Magic Moves. 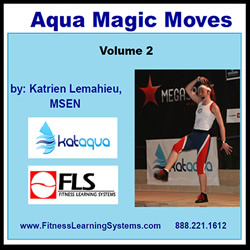 Understand the concepts for base movements and combinations for Aqua Magic Moves. Learn, view, and practice the Corner Kick with variations, combinations, and transitions. Learn, view, and practice the Rocking Mambo with variations, combinations, and transitions. Learn, view, and practice the Circle 3 Ski with variations, combinations, and transitions.